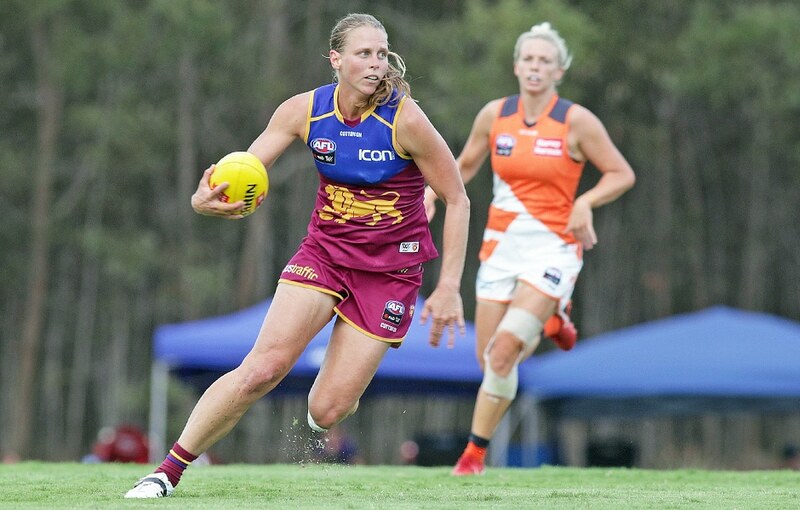 The Brisbane Lions has been the benchmark of the AFL Women's competition for the past two years and looks to be strong again in 2019, with five players making AFL Women's team of the week for Round 1. In their third season at the Lions', Shannon Campbell, Kate Lutkins, Ally Anderson, Jess Wuetschner, Emily Bates were all selected in the season's first team of the week. The team is selected to mirror the All-Australian team: five defenders, six midfielders (including a ruck), five forwards and five interchange players. Like the All Australian team, we have selected players in general categories, rather than in traditional positions. The 16-a-side set-up often means teams play with varying configurations, making set selections (e.g wings and flanks) difficult. Brisbane's defence was resolute in the face of a fierce Giants line-up, with Lutkins and Campbell contributing to the Giants having just 23 inside 50 entries, the fewest of any side this round. Bulldog Spark set AFLW records for the most marks in a match (11) and most intercept marks (five), as well as finishing with a career-high 14 disposals. Geelong's McDonald (15 disposals, four marks) made a stunning return to the AFLW (she last played for the Bulldogs in 2017), cutting off numerous Collingwood attacking forays. The versatile Duffin (18 disposals and seven marks) looks set to continue in defence at new club North Melbourne and set up a lot of the Roos' rebound. Shannon Campbell during the Round 1 clash against the Giants (Picture: TJ Yelds). Pearce had an excellent winter, finishing second in the VFLW best and fairest playing for Darebin. She was one of Melbourne's best in its loss to Fremantle with 32 hit-outs, 11 disposals (10 contested) and five clearances. Marinoff (24 disposals and 11 tackles) and Blackburn (17 disposals, six marks, six tackles and 328 metres gained) were dominant for their respective sides in a very low-scoring (but hotly contested) affair. Lions' Anderson had a breakout year in 2018, finishing third in the club's best and fairest, and looks to have built on that form. She set the tone early with her hard running, finishing with 22 disposals (14 contested possessions), five clearances and seven tackles. Karen Paxman continues to cement her status as one of the competition's elite midfielders with 18 contested possessions and a round-high nine clearances, while young star Nina Morrison (22 touches, six clearances and eight tackles) was outstanding in her first game. Ally Anderson during the Round 1 clash against the Giants (Picture: David Layden). There's been a lot of talk about North Melbourne's high-profile recruits, but Riddell (16 disposals and one goal) stole the show with her agility and pace, playing both forward and on the ball. Established defender Antonio's switch forward could be the move of the season, the Docker causing havoc for Melbourne defenders with 14 touches and a goal. Garner (17 disposals and one goal) was strong in the air and creative on the ground, Staunton was dynamic with a career-high 14 touches. Wuetschner was her typically dangerous best, top-scoring for the round with three goals. King takes the ruck/forward rotation spot, looking very dangerous up forward with two goals and the highest percentage of hit-outs to advantage (38). Bowers made an excellent debut after two years on the sidelines, finishing with 12 tackles and a vital fourth-quarter goal, while Prespakis was equally impressive in an out-classed Carlton side, playing predominantly on the ball. The ever-consistent Bates had 17 effective disposals (and 22 overall). Brazill looked increasingly comfortable at full-back as the match progressed, finishing with 16 disposals and 438 metres gained, the second-most for the round.